Alcohols are neutral to litmus. They experience diverse reactions based on the position of cleavage of the bond, RO-H or R-OH making an alkoxide ion or making a carbonium ion correspondingly. Alcohols have no effect on the pH paper or sodium hydroxide. The measurement of pH value of ethanol by a pH meter symbolizes that ethanol is neutral. Alcohols are in reality amphoteric in nature. As an acid, it ionizes to make an alkoxide ion (RO-) and hydrogen ion, H+ in the presence of base. The order of acidic strength of alcohol is as: 1° alcohol > 2° alcohol > 3°alcohol. This represents that water is a stronger acid than ethanol. The Aromatic alcohols, for illustration C6H5CH2OH, behave in a similar manner as tertiary aliphatic alcohol due to the electron donating properties of the benzene ring. Alcohols generally burn in the air to give carbon (IV) oxide and water. For illustration: If ethanol burns in air by a pale blue flame to give carbon (IV) oxide and water. Apart from the combustion, alcohols experience many other reactions and the kind of reaction based on the position of cleavage of the bond. There are two likely position of cleavage, giving two classes of reactions. Either of these reactions might yield the substitution or elimination product and generally a mixture of the two depending mostly on the nature of the alkyl group to which the hydroxyl group is attached. In A, the lower +I (I signifies inductive effect) effect from one alky group favors the formation the alkoxide ion, RCH2O- whereas in C the greater +I effect from the three alkyl groups stabilizes the intermediate carbonium ion, R3C+ . 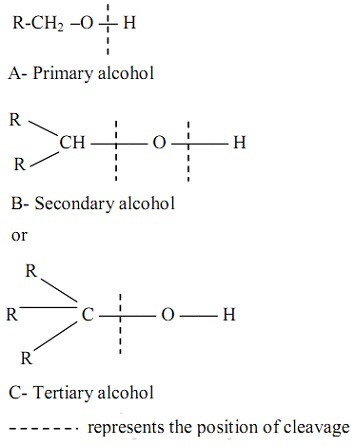 The order of reactivity is as shown: 3°alcohol > 2°alcohol > 1° alcohol. The reaction is a nucleophilic substitution reaction. The reaction takes place whenever concentrated hydrochloric acid is placed to absolute alcohol and then refluxed in the presence of the anhydrous zinc chloride as catalyst. The order of reactivity is as shown: 3° > 2° > 1°alcohols. An insoluble haloalkane will be made and a cloudy mixture appears. The time it takes for the cloudiness to come out and for separation into two different layers points out the kinds of alcohol. For 3° alcohols, two different layers are made instantly, 2° alcohols forms two different layers in around 10 minutes whereas for 1o alcohols, a cloudy look is observed after refluxing for few hours. The reaction is supposed to occur through the SN1 method as concentrated hydrochloric acid is utilized. The stable the carbonium ion, the faster will be the reaction rate and the faster is the time for appearance of cloudiness. For illustration, use of phosphorus (V) chloride for chlorination. This reaction can be taken out by adding solid phosphorus (V) chloride directly to the alcohol in a dry test-tube. Whenever phosphorus (III) chloride is utilized rather than phosphorus (V) chloride, the reaction is less vigorous. Alcohol is refluxed by sulphur dichloride oxide (that is, thionyl chloride) in the presence of a small quantity of pyridine, C5H5N that serves to absorb the hydrogen chlorides as it is formed. Whenever alcohols react by phosphorus trihalide under reflux, the product is a haloalkane. Phosphorus trihalide can be made simply by adding red phosphorus and a halogen to the reaction mixture under reflux. The products are obtained via distillation at the end of reaction. Dehydration of the alcohols can be carried out by utilizing dehydrating agents like concentrated tetraoxosulphate (VI) acid or aluminum oxide to provide the corresponding alkenes. Whenever alcohol vapor is passed over the aluminium oxide catalyst heated to 350°C or by heating to 170°C with surplus concentrated tetraoxosulphate (VI) acid, the corresponding alkene is made. For illustration, the hydration of ethanol provides ethene. The reaction above can only occur with alcohols which have at least one hydrogen on the adjacent carbon. For illustration, methanol can't experience dehydration. The alkene generated in greater abundance is pointed out by Saytzeff's rule. Saytzeff's rule defines that the alkene formed preferentially is the one having the higher number of alkyl groups. In the dehydration of butan-2-ol, the predominant product is but-2-ene. Alcohols react by reactive metals such as sodium and potassium to form metal alkoxides and hydrogen gas. The metal alkoxides are stronger bases than the sodium hydroxide; they are generally employed in the organic reactions needing a strong base in a non-aqueous solvent. This reaction is alike to the reaction of water with reactive metals, though alcohols react more slowly by reactive metals than water. This is the reaction in which an alcohol reacts by carboxylic acid in the presence of concentrated tetraoxosulphate (VI) acid to form esters. For illustration: the reaction of ethanol by ethanoic acid to form ethyl ethanoate and water. Esterification reaction is instead slow reaction even with heating. The reaction is reversible and the yield poor. The forward reaction is termed as esterification whereas the backward reaction is known as acid-catalyzed hydrolysis of ester. Whenever excess acid or alcohol is added to the reaction mixture, the equilibrium will shift to the right hand side. Alcohols can be oxidized via making use of common oxidizing agents like acidified potassium tetraoxomanganate (VII) or acidified potassium heptaoxodichromate (VI) to give the corresponding carbonyl compound or the carboxylic acid. 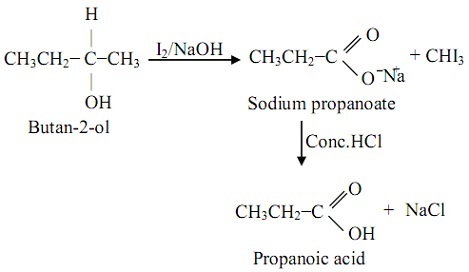 Primary alcohols are readily oxidized on heating to aldehydes however in the presence of excess of the oxidizing agent the reaction carries on further to outcome the carboxylic acid. Secondary alcohols are oxidized to the corresponding ketone. Ketones are quite resistant to the oxidation and don't experience further reactions unless they are subjected to severe conditions. In that situation they are oxidized to a carboxylic acid- a mixture of smaller carboxylic acids will be formed as it comprises breaking a carbon-carbon linkage. Tertiary alcohols are as well resistant to oxidation. They are not oxidized at all in neutral or alkaline media. In the acidic medium, tertiary alcohols undergo dehydration to the alkene that can be readily oxidized to the diol and further oxidation outcomes the oxidation products of primary alcohols. Some alcohols with the structure react by an Iodoform reagent (that is, iodine in the presence of sodium hydroxide), a mild oxidizing agent to give sodium carboxylate and triodomethane (as well termed as Iodoform). The product, triiodomethane appears as the yellow precipitate in the reaction mixture. The reaction is a helpful reaction for confirming the presence of the group in an alcohol and as well a helpful means of synthesizing carboxylic acids that will have one carbon less than the parent alcohol. 1) Lucas Test: To the unknown alcohol, add Lucas reagent that is, a mixture of concentrated hydrochloric acid and anhydrous zinc chloride in ratio 1:1 at room temperature. The tertiary alcohols reacts by Lucas reagent generating instant turbidity in the reaction mixture, the secondary alcohols give turbidity in 5 to 10 minutes, and the primary alcohols don't provide turbidity at all at room temperature. 2) Oxidation Test: The product formed from the oxidation of alcohols can be employed as a test for alcohols.